The movie industry seems to be overflowing with hyphenates more than ever these days. Writer-directors have been common for years. Actor-directors are becoming more common every day (Angelica Huston and Edward Norton have recently joined the ranks of Mel Gibson, Kevin Costner and dozens of others), as are actor-producers (Drew Barrymore, Tom Cruise). Occasionally you'll even see an actor-writer-director. Here's a new one: Writer-director-Tibetan monk. Khyentse Norbu, a lama recognized as the incarnation of a 19th Century Buddhist saint, was bitten by the filmmaking bug in 1992 when he served as a consultant on Bernardo Bertolucci's "Little Buddha." In between duties of devotion, he soon began experimenting with short films and last year he completed his first feature, a modest and supremely entertaining slice-of-life comedy called "The Cup," about the students at one of his monasteries in Bhutan going bananas with World Cup fever. Dressed in traditional, muted orange and red robes, Norbu looks a bit out of place in his upscale hotel suite in downtown San Francisco, where he's visiting on the distributor's dime to promote the movie in the United States. A tranquil fellow (especially compared to most filmmakers with a picture to hock), he has a pious, sedate demeanor. But he also shines a broad, gracious smile across his 40-ish face when he gets to talking about movies. Yes, he has a VCR at the modest home he keeps just outside the walls of the monastery where the film was shot, and "I used to travel with Truffaut's '400 Blows'...(and) Cocteau's 'The Blood of a Poet.'" But now he'd rather go out to the movies when he has the chance. What has he seen on this trip to the U.S.? "Oh, a really good one. 'American Beauty,'" he says with characteristic economy. "And I liked 'The Matrix.'" He also confesses to deliberately seeking out bad movies when he's in the West. He saw "Eye of the Beholder" last week and, his publicists pipes in, he had to be talked out of going to "Scream 3" just yesterday. Otherwise accustomed to a life of quiet serenity, he's a fascinating but difficult interview. His answers are frugal, although the fact that he's fallen in love with filmmaking comes across pretty clearly. So does the fact that he's savvy to the business. He wrote "The Cup" in English to more easily find financing. "I need to get producers from the West," he acknowledges. "Obviously I can't get (money) from the Tibetans or the Buddhists. Plus, there's not (a) culture for writing a film script (in Bhutan). There is a Tibetan study of writing drama, but it's really different." Based on real events, this lighter side of monastic life features students from the school where he filmed, and it stars a 14-year-old student named Jamyang Lodro as -- essentially -- himself: A soccer-obsessed young monk who turns renting a TV to watch the World Cup finals into a cause célebre among his cloistered compatriots. 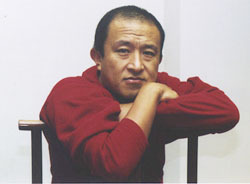 Norbu translated the story back into Bhutanese for his cast, many of whom were playing characters not far removed from their real lives on this seat-of-his-pants production. "The filmmaking process had to be like that. I was dealing with an situation where filmmaking never exist(ed)," Norbu explained, leaning back in a plush chair, this fingers folded in front of his face. "Not only had the actors never performed, but the filmmaking -- the whole process -- never exist(ed) in that culture. I had to look at the situation and shoot according to that." The trappings of his holy life also played a role in the creative process, as Norbu often made technical decisions based on the advice -- received through meditation -- of one of the elders at this monastery. "Technical question would arise -- for instance, about what film stock I would use. Because I don't have a proper film school training, I don't know myself. I ask my (filmmaking) friends, who give me all kinds of answers. So I opt for the fastest way of deciding things. I ask this old monk, who is in the film, and he does his mediation and he touches his rosary, and beyond that I don't know what he does." So you got your answer on faith, and you went with it? "Yes," he replies without elaboration. The idea for this film came to him 12 years ago when he found himself in a disciplinarian position similar to that of a character in the film called Geko. "I found some young ones sneaking out of the monastery (to watch soccer) myself. So it's autobiographical a little bit." Are the young monks in his charge a lot of trouble? "Yes," he smiles. "In (a) Tibetan expression, we say that young monks are seven times much wilder than normal kids." On the topic of Tibet, Norbu says he's sadly resigned to what has become the status quo. He has visited the Chinese-controlled country "as a tourist" and found the trip frustrating because he doesn't foresee the nation being free in his lifetime. The Chinese government is too stubborn, he says. "I never thought about politic when I make this film. But when you make a film about life inside a (Tibetan) monastery, certain aspect of politics are unavoidable. I try to make it more humorous, try to tone down the politic because I don't want to make propaganda." Asked how he feels about the Chinese government's attempts to control the Buddhist faith through official sanctioned lamas, he demonstrates some of that sense of humor he lent to the film. "It's very amusing. One could almost make a film," he offers with a bemused grin. But if "The Cup" is a success, such a film won't be his next project. "Right now I have a story in my head (about) village life in Bhutan and a rice paper factory. I'm still writing it." In the mean time Norbu will take a break to let his life slow back down to his more accustomed pace. "It (will be) difficult to go back to India, where you have to wait for train for eight hours. Sometimes when you stay here in America or in Europe for too long, you tend to forget how comfortable life is here. When you go to India, you appreciate it."